Jonnie and I truly hope that your celebration of Jesus’ birth was filled with joy, worship, laughter, giving, eating and just enjoying the blessings of being known and loved by our Lord, and knowing Him as the giver of our lives now and for all eternity. How great it is to celebrate Jesus! – and the Father – and the Spirit. Are you rushing away from Christmas? Christmas was this past Tuesday, and two days later 3 of my neighbors had already taken down their outside Christmas lights and decorations. That brought a thought to mind…Are we rushing away from Christmas? Or are we taking a little extra time to “linger at the manger”? Are you still enthralled with God coming to this earth…to us…to be WITH US and to LIVE IN US…every day of the coming year? My lights and decorations are still up, and will be for another week or two (waiting for snow to take pictures). January is so drab and dark. So for me to look out each evening and see the Lights shining their glow over the frozen and so far, bare ground…makes me joyous, and reminds me that Jesus is the light of my life. He desires to shine in the “dark and dreary” parts of my life as I enter into and progress through the New Year. What a great and loving Lord we have and serve. Psalm 89:15 – Blessed are those who have learned to acclaim you, who walk in the light of your presence, Lord. John 1:4 – In him was life, and that life was the light of all mankind. Praise Him for all that is past. Trust Him for all that is to come. On Epiphany we rejoice in the unveiling of God with us in the person of Jesus. That revealing occurred in the past (Jesus’ first coming), continues in the present (Jesus coming to us through the indwelling Spirit), and will culminate in the yet-future return of Jesus in glory. Jesus, God unveiled to us, come! 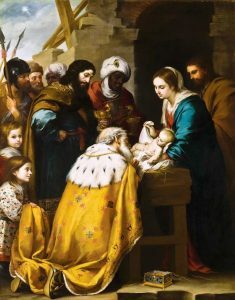 On Epiphany, Christians typically commemorate two important events in Jesus’ first coming: the visit of the Magi to pay homage to the infant Jesus (typically celebrated by Christians in the West) and Jesus’ baptism (typically celebrated by Christians in the East). Through his baptism, Jesus was revealed to be God’s unique “beloved Son” (Matthew 3:16-17 ESV). Through the Magi’s visit (Matthew 2:1-2), Jesus was revealed to be Lord and King of all humanity (Jews and Gentiles alike). The Magi were the first Gentiles to acknowledge Jesus as King, and thus through them, the incarnate Christ was revealed to the wider world. Their act of worship (Matthew 2:10-11) corresponded to Simeon’s prophetic statement that Jesus would be “a light for revelation to the Gentiles and the glory of your people Israel” (Luke 2:25-32). This was one of the earliest indications that Jesus’ vicarious life embraces all people, nations and races. Commemorating these events on Epiphany reminds us of the mission of the church. As disciples of Jesus, we are called to participate in what our Lord is doing, by the Spirit, in all the world. We are called to share in his work to reveal himself and his salvation—a salvation that he has made available to all humanity. Epiphany reminds us that in our union with Christ, we can enjoy communion with him as we participate with him in his continuing mediation and ministry for us and the whole world. This includes what he is doing to reveal himself to be who he truly is: the Light of the world. As we think about our calling, Epiphany reveals to us that we are not thrown back upon our own resources and efforts in this participation, but that all things are in and under Jesus, the Lord and Savior of all. In that we trust and rely, and because of that we celebrate! 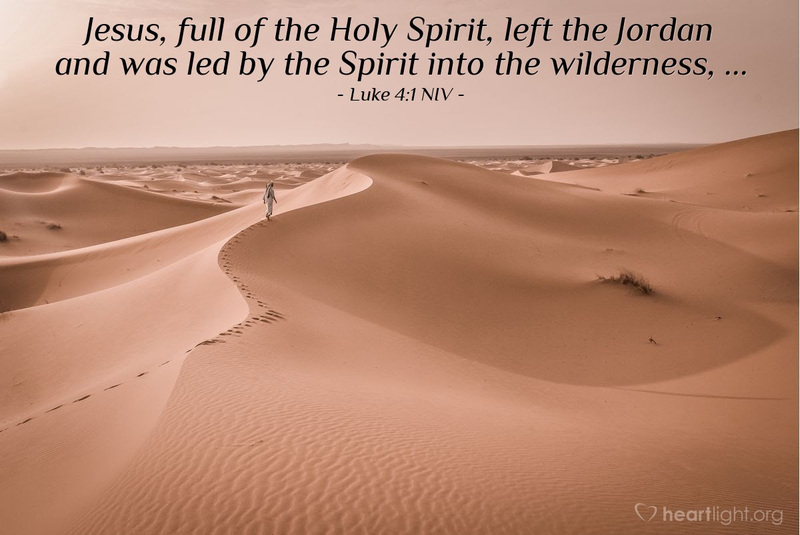 Jesus goes into the wilderness full of the Holy Spirit and led by the Holy Spirit. The role of the Spirit in the wilderness is crucial. The wilderness is a place for Jesus to be alone with the Father. In addition, this time of Jesus in the wilderness will also be a time of testing and trial. As we have journeyed this past year through Scripture seeking to learn more about the presence, power, and work of the Holy Spirit, we have repeatedly seen two phrases: “full of the Holy Spirit” and “led by the Holy Spirit.” These phrases apply to Jesus’ ministry and also describe the Spirit’s work in our lives (Ephesians 5:18; Galatians 5:18-25). Jesus faced trials and temptations. He overcame them as the Spirit filled him and led him. Similarly, we can overcome life’s difficulties as we are filled with the Holy Spirit and led by the Holy Spirit. So let’s commit to focus this next year on being filled and being led. Let’s invite the Holy Spirit to be our Comforter, Counselor, Advocate, Helper, and Friend (John 14-16). Let’s trust that as we focus our hearts on Jesus and immerse ourselves in his story, the Holy Spirit will work his miracle of transformation in our lives (2 Corinthians 3:18). We have received a great gift in Jesus. Jesus now wants to use the Holy Spirit in our lives to make that gift complete. Holy and righteous Father, thank you for the gift of Jesus and the gift of your Holy Spirit. As I finish this year and anticipate a new year ahead, help me that I may journey into the future yielded to Jesus as Lord, filled with the Spirit, and led by the Spirit into the life ahead of me. I want my life to reflect Jesus, in whose name I pray. Amen. 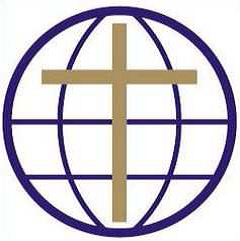 Prayers for our Persecuted Christian Brothers & Sisters. Haiti – That peace and calm can return to the beautiful people of Haiti. Ron Barker — For complete healing from a recent kidney transplant. Jean Renel Pierre – (Haiti GCI) For recovery and healing from a fractured ankle. He lives near Les Cayes in SW Haiti. Nikki Talison (Al & Marilyn’s daughter-in-law/Chris’ wife) Prayers for recovery from congestive heart failure. Georgia – (Laf. area) Harriette Cox’s daughter, Georgia, has begun chemo for cancer. Traci Johnston Calvert – daughter of Ted & Donna Johnston – In Houston, she has begun chemotherapy to treat cancer. Georgia – (Laf. area) Harriette Cox’s daughter, chemo for cancer. Anthony & Jane Gachanja – (GCI National Ministry Leader in Kenya) They live in Nairobi, Kenya, Africa…prayers for blessings and protection as they minister to the beautiful people in the GCI churches in Kenya. Hector & Paulina Barrero (GCI Mission Developer/Coordinator for Columbia & South America) For blessings, protection and inspiration as they minister to others. Kalengule & Nsama Kaoma (Lusaka, Zambia, Africa) Prayers for wisdom & protection as he oversees Africa as GCI Mission Developer/Coordinator.